Google has finally released its highly anticipated Pixel Slate on the UK, US and Canadian markets. The device has a sleek design and a promising spec sheet, but it seems confused. Does it want to be a tablet or a laptop? It's a great notion on paper - offering the best of both worlds. However, sometimes that leads to a device overpromising and underperforming in both areas. This is one of multiple reasons that has led me to be skeptical of Google's Pixel Slate. When tablets first became mainstream, it seemed that manufacturers were as baffled as consumers on what functions they should perform. Should they be a phone with a bigger screen? A weaker but more portable laptop? Or something that provides a brand new user experience? Although Apple by no means invented the tablet as a concept, they have led the way in many regards. iPads offer multiple apps designed specifically with large screen functionality in mind. Android tablets have tried to keep up, but if we are to judge by their market share, they have failed. 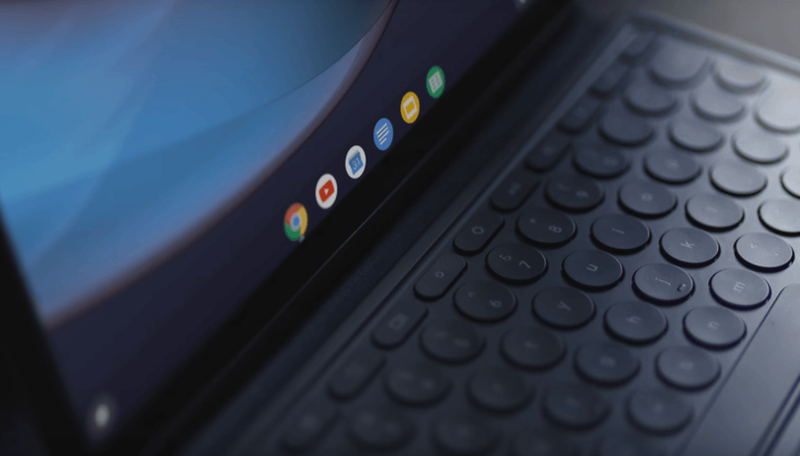 Now with the Pixel Slate, Google seemingly wants to challenge Apple for tablet market dominance. At a glance, the Pixel Slate looks as sleek as most iPads, despite its larger bezels. Its specs also seem just as promising. However, I still have some reservations, especially considering that the new tablet's operating system is Chrome OS. Great specs but at what cost? The Pixel Slate comes in 4 variants, each more powerful than the last. The top specced Slate sports an 8th Gen Intel Core i7 Processor, 16 GB of RAM and 256 GB of storage. However, this model has the high price to match - $1599 (£1,549). The cheapest one, on the other hand, is $599 (£549). It has an Intel Celeron processor and much less impressive overall specs. However, neither variant comes with any peripherals like the clip-on keyboard or pen. These accessories will set you back a significant sum, as they cost $199 (£189) and $99 (£99), respectively. In my opinion, it's ridiculous to ask so much for devices that are at the core of the Slate user experience (the keyboard specifically, which I will get into later). Even the Microsoft Surface Pro keyboard, which received some backlash, costs less ($150). It seems that the days of affordable and powerful Nexus tablets are over. Google is now manufacturing 'premium' devices. I am not willing to spend $300 on tablet peripherals. The question is who are they going to appeal to? The Apple crowd is not easily convinced into trying new products because of Apple's closed ecosystem, while the average consumer can find better devices at lower cost. Microsoft Surface users don't have many reasons to switch either. Besides, for $1500 you can easily purchase a very powerful and slim Windows laptop, which although a tad heavier in most cases, would be able to perform a lot more functions than the Slate. Chrome OS, for example, does not have support for the full versions of Adobe Creative Suite apps. Another thing I have to mention is that there is no information on what graphics chip the Pixel Slate uses. If you want to be a laptop, in my opinion, you have to provide a decent gaming experience. You are able to connect the Slate to a mouse, monitor and keyboard, but what's the point in that (and having amazing specs), if the most challenging thing you'd put the device through is writing documents or watching Netflix? It seems that Google has lost confidence in Android - at least in terms of tablets. Until now the Chrome OS has been largely reserved for laptops. Not only that, Chromebook devices were usually cheap alternatives with price tags in the low hundreds. So, is there anything that makes the Slate stand out besides its 2-in-1 nature? One of the new features is being able to use Android apps via the Play Store. However, as Android tablets are not exactly popular, there aren't that many apps designed with large screens in mind. I haven't had the chance to test app functionality myself yet, but my expectations derived from experiences on Android tablets aren't exactly high. This sentiment is echoed online by those who have already tested the Slate. A point in the Chrome OS tablet's favour is the true desktop browser experience its Chrome offers - while mobile browsers are getting more and more advanced, they still can't rival desktop ones in terms of features, add-ons and so on. However, there have been some concerning instances of stuttering and lag on lower-end test devices, as reported by the Verge and other media. It could be a software issue, which could be resolved quickly, as Chrome OS is updated every 6 weeks. However, it could also be indicative of more serious problems. The Pixel Slate has some productivity features that might be attractive to the business and professional crowd, who are always on the go. But first, let's get back to the keyboard - it doubles as a magnetic cover, which is quite handy. The magnetic back portion of it is used as a stand and can be folded at various angles for greater comfort. Yet, the keyboard is an important component for another reason too. The Pixel Slate functions like a Chromebook when it is attached. When it's not, it goes into tablet mode, with fullscreen apps. You can still multitask with the split-screen functionality, but this makes the keyboard an absolute requirement if you want the full Pixel Slate experience. Of course, as any Chromebook, the Slate also comes with Gsuite, which can be used offline. Google also promises a battery that will last up to 12 hours. If true, it could be a huge point in its favor - most modern laptops or tablets don't last nearly as long, no matter what their manufacturers claim. But we will have to wait and see if Google's claims are accurate too. The best and most advertised feature of the Slate, however, is its integration of Google Assistant. It has its own keyboard button too. Yet, to me, its inclusion is more of a marketing gimmick. It will only truly be useful in certain situations and it's not something I'm particularly excited about. Besides the features I listed, there isn't much else Google is boasting about - which further increases my skepticism. Google Assistant is a must have feature on the Pixel Slate. In conclusion, it seems that the Pixel Slate can't decide what it wants to be, and for its premium price, it doesn't offer anything spectacular. Google has not announced dates for its release to the European (UK is the only exception) and Asian markets either, which might be interpreted as the company not having much confidence in the device's potential. This is why, for now, I remain skeptical. But if do get a chance to test the device for an extended period of time and the Slate surprises me, I will be sure to let you know. What do you think? Are you a Pixel Slate enthusiast? Let us know in the comments. I have to say the author just ignores a lot of other important facts. iPad does not have full browser (how that can ever be a productive tool?). iPad does not allow you to share the device with multi people (if you think about this, you need to buy iPad for each member of your family - the Slate suddenly looks like a bargain). More importantly, you can't ignore that many people are not happy with outdated, touch-unfriendly Windows as a tablet. The conclusion? If you are not very happy with mobile browser of iPad, but hated the touch features of Windows, I don't see why the Slate does not look attractive. I never implied that the iPad is the better choice compared to the Slate. I did say that the Slate will not appeal to existing iPad users, which in my mind is true. For many, however, the iPad is the better device compared to Android tablets. You also either ignored or didn't read this: "A point in the Chrome OS tablet's favour is the true desktop browser experience its Chrome offers - while mobile browsers are getting more and more advanced, they still can't rival desktop ones in terms of features, add-ons and so on." Finally, the Slate is not exactly share-able either. If you know of some ways that it can be shared besides what's mentioned in the article, let me know. People like me. People that have Android phones and then can turn around use the same apps without have to buy them again. People that want a premium experience ( like metal build, high resolution screen) without going to windows or apple. This is not the device to get you to switch to Chromebooks. It is for those that already use Chromebooks. It is Google's surface pro, that doesn't make sense but looks good being carried around. I don't get when people acted shocked and say who is going to spend this kind of money to browse the web and type emails. Guess what? People do it all the time. I'm sure we all know someone who bought an iPad pro to do just that. Any device with a floppy keyboard is not a true productivity device because it hampers that, and the laptop is still the supreme portable productivity device. Also the slate is using Intel integrated graphics 615. "Guess what? People do it all the time." Oh, absolutely. People are free to spend or waste their money however they want. I'm more disappointed that Google has changed their trajectory so much and are pulling 'an Apple' with the Slate. They used to offer amazing affordable devices, that didn't always have a premium look or feel, but had great specs. That's just not the case anymore, at least not the affordable part. Google competes in the same segment that the others do. Again Google is offing premium products for those who want it. The slate may be a mediocre tablet and mediocre laptop, but it can do both unlike the iPad and surface, as each one is poor at one thing. I would agree it is overpriced a bit especially the keyboard accessory.